Tribute to the BMW 3.0 CSL, a timeless classic and iconic BMW Coupe from the 1970s. 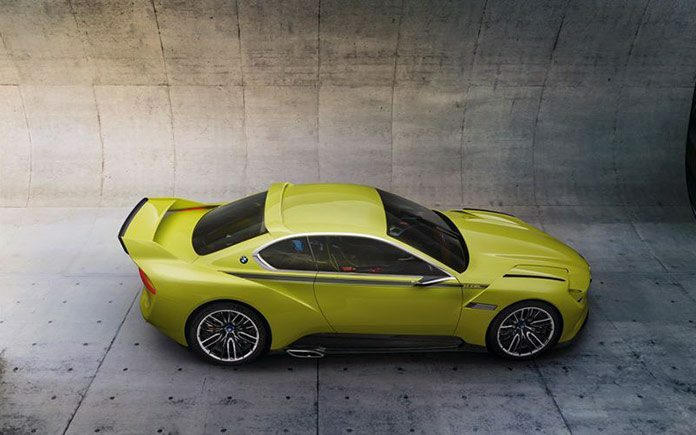 Amid the audacious design studies and automotive beauties from a bygone era gathered at the Concorso d’Eleganza Villa d’Este, the BMW Group presented its new BMW 3.0 CSL Hommage. 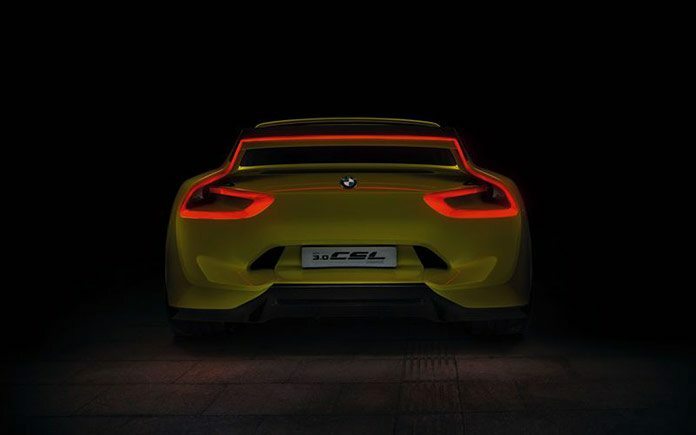 This model is the BMW Design Team’s tribute to the BMW 3.0 CSL, a timeless classic and iconic BMW Coupe from the 1970s. 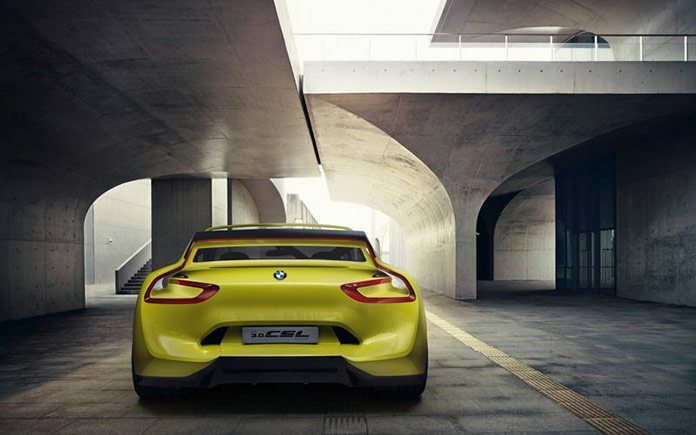 The BMW 3.0 CSL Hommage is a nod to the engineering achievement exemplified by the BMW 3.0 CSL in its lightweight design and performance. The Hommage draws on the character of the earlier model and endows it with cutting-edge materials to translate it into the present in a new and exciting guise. “Our Hommage cars not only demonstrate how proud we are of our heritage, but also how important the past can be in determining our future…The BMW 3.0 CSL Hommage represents a nod to the engineering achievement exemplified by the BMW 3.0 CSL in its lightweight design and performance. 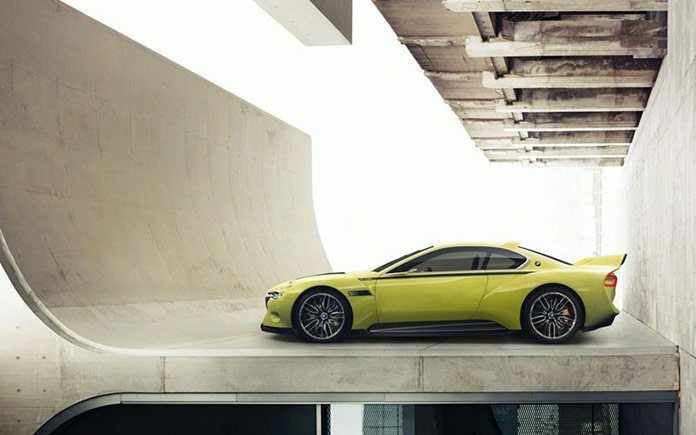 With intelligent lightweight construction and modern materials, the 3.0 CSL Hommage brings the character of that earlier model into the 21st century, showing it in a new and exciting guise” says Adrian van Hooydonk, Senior Vice President BMW Group Design. “CSL” stands for “Coupé Sport Leichtbau” (coupé, sport, lightweight). With its aluminium bonnet, boot and wings, Plexiglas windows and equipment rigorously pared down to the bare essentials, the old BMW 3.0 CSL tipped the scales around 200 kg lighter than its sibling model, the BMW 3.0 CS. Unsurprisingly, then, it was predestined for a career on the race track. Whereas the material of choice in the 1970s was aluminium, today carbon fibre – or carbon-fibre-reinforced plastic (CFRP) – offers the optimum weight-to-strength ratio. These high-strength fibres are even lighter and stronger than aluminium. 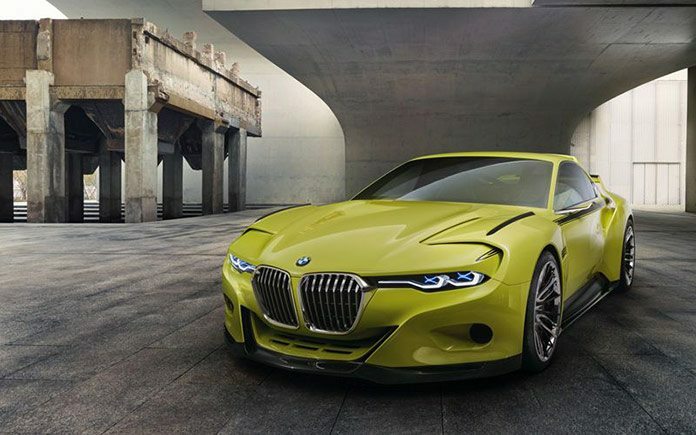 And the BMW 3.0 CSL Hommage makes generous use of the high-tech composite, reinterpreting the concept of lightweight design for the modern age. Wherever CFRP is used, it is also visible – rendering the lightweight design principle tangible both inside and out. The BMW Group is a world leader in the production and application of CFRP in automotive design and can already boast many years of experience in series production of CFRP structural parts for the BMW M and, in particular, the BMW i. 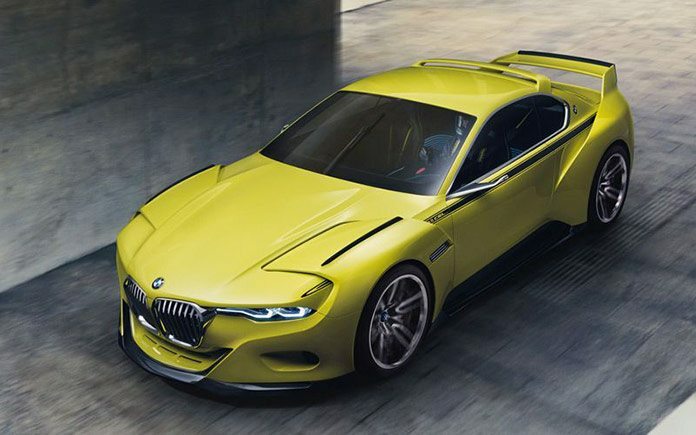 The BMW 3.0 CSL Hommage is a vision of pure athleticism: the elongated body is set off by distinctive air deflectors, powerful wheel arches and prominent spoilers to the roof and tail. Despite its size, the aerodynamic elements are key in enabling air to flow optimally along the sides of the vehicle. The front air deflector serves to vent the engine compartment, while wings over the rear wheels ensure optimum airflow around the vehicle. Small rear-view cameras serve to further reduce aerodynamic drag. The large rear spoiler increases downforce on the driven rear axle and in so doing improves power transmission. The Air Curtain and Air Breather systems guarantee optimum ventilation of the wheel housings. And the sheer self-confidence and sporting prowess of the BMW 3.0 CSL Hommage are perfectly summed up in the original colour of its spiritual predecessor – Golf Yellow. 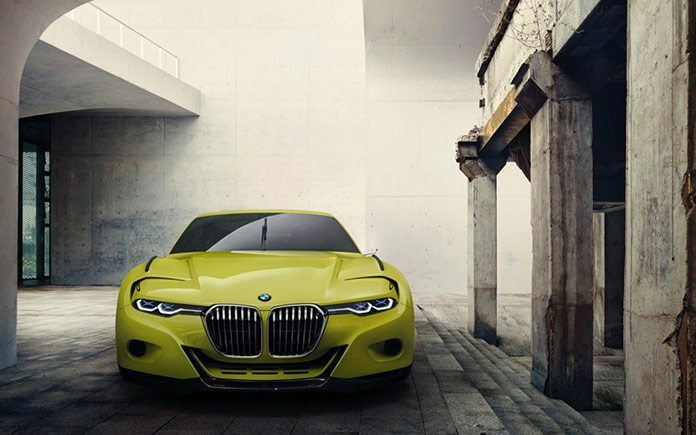 Boasting one of the broadest and lowest front ends of any vehicle in the BMW Group, the BMW 3.0 CSL Hommage’s front exudes pure power and athleticism. At the centre, the characteristic BMW kidney grille stands tall in citation of the more upright styling of the kidney grille of yesteryear. The size and spatial depth of the kidney grille symbolise the output of the powerful six-cylinder in-line engine with eBoost. At the same time, the finely wrought geometry of frame and kidney struts lends the front end an air of quality and exclusivity. The characteristic four-eyed face gives a contemporary, hexagonal interpretation of front-end sportiness. Laser light and LED technology facilitate slender, state-of-the-art lighting graphics, and the flat contours of the headlamps generate that characteristically focused BMW look. A stylised “X” inside the lights divides the lighting functions and conjures up memories of the X-shaped headlamp stickers once used in long-distance racing. Horizontal LED strips create a visual bond between headlamps and kidney grille while at the same time emphasising the broad, flat impact of the front end. A large carbon-fibre front splitter reduces the gap between road and front end and, in combination with the kidney grille, offers a modern interpretation of the earlier car’s highly distinctive shark nose. Two circular openings and a series of elongated slots pay tribute to other elements featured in the earlier car, but offer a new interpretation for the 21st century. The all-round shoulderline is also the starting point for the subtle, finely sculpted surfaces of the sides. It follows the development of the shadowy areas behind the front wheel all the way to the lit surfaces above the rear wheels. This interplay between light and shade lends movement and dynamic intensity to the generous surfaces of the vehicle’s sides. Dark CFRP areas narrow the gap between the sides and the road, again paying tribute to the consistent lightweight design of the BMW 3.0 CSL. In combination with the black graphic accents, the dark lightweight elements reduce the perceived height of the vehicle and further emphasise its flat silhouette. The black 21″ alloy wheels in matt and high-gloss bi-colour versions offer an additional unique highlight. Air control blades in the interstices of the wheel rims, meanwhile, serve to further optimise aerodynamics. As with the front end, the vehicle’s tail is broad and muscular in design. Generous surfaces generate presence, horizontal elements emphasise width. A particular highlight is the styling of the rear lights: an LED strip above the spoiler links the two lights, thus giving the rear end a formal framework. The powerfully sculpted rear apron with CFRP diffusor creates a visual impression of the BMW 3.0 CSL’s raw power. Even viewed from above, the BMW 3.0 CSL is extremely dynamic. From kidney grille to headlamps, the bonnet traces a broad “V” – a nostalgic throwback to a distinctive and dynamic element of earlier BMW coupés. Pared down to a minimum, the interior of the BMW 3.0 CSL Hommage puts its lightweight design on show and renders its racing character elegantly tangible. All interior elements are there out of absolute necessity, every part has a high-quality design, structural or drive-related function. In the all-CFRP interior, the only wood-like presence is the “instrument panel” – a cross-member and purely structural element. This is a clear reference to the interior of the earlier BMW 3.0 CSL, which featured an all-round wood trim throughout the interior. In the new version, only the small central eBoost charging display interrupts the wooden instrument panel. Infotainment is equally minimalist in concept: a central display on the steering column informs the driver of the current gear, speed, revs and shift point. In its use of cutting-edge materials and detailed solutions, the BMW 3.0 CSL Hommage displays technical sophistication and subtlety of form. Meticulously crafted aluminium sleeves add high-quality accents at the junctions between individual structural elements. The door design is as minimalist as it is expressive: precise, clean surfaces trace an arc rearwards, lending the door element a flowing, dynamic quality. The door openers combine a DTM-style pull strap with the elegant handle-integrated opener of the earlier BMW 3.0 CSL, resulting in the hybrid solution of a nylon pull strap located directly behind the grab handle in the door. As with the interior as a whole, this detail lends expression to the unique character of the BMW 3.0 CSL Hommage: a winning combination of lightweight design, athleticism and elegance.